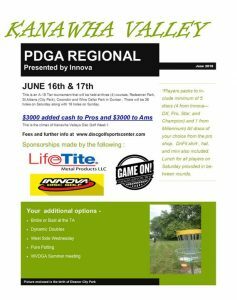 The Third Annual Kanawha Valley Regional Tournament will take place Saturday, June 17, and Sunday, June 18, 2017. 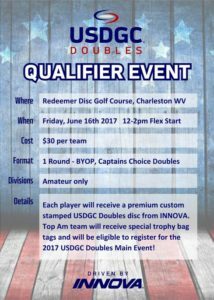 This is a pro A-tier/amateur B-tier tournament that will be held at Redeemer Park, Wine Cellar Park, and St. Albans City Park. A total of $4000 cash will be added to the pro prize pool, and $2000 will be added to the amateur prize pool. 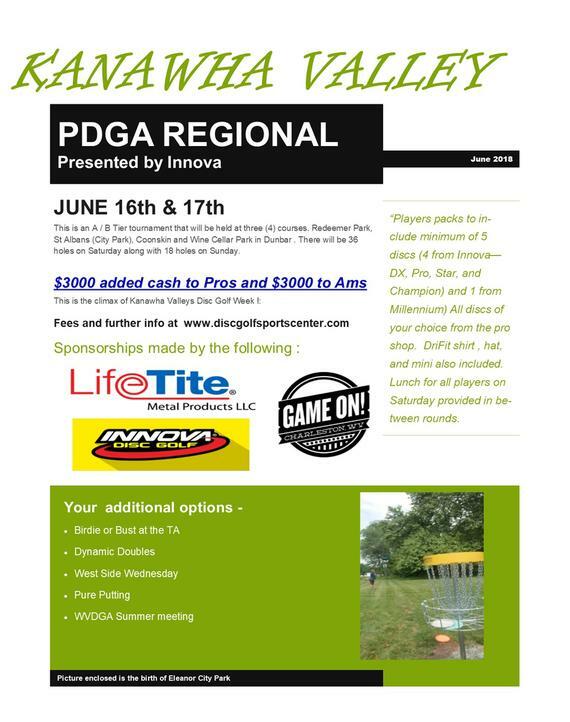 Online registration and other information can be found at The Disc Golf Scene. 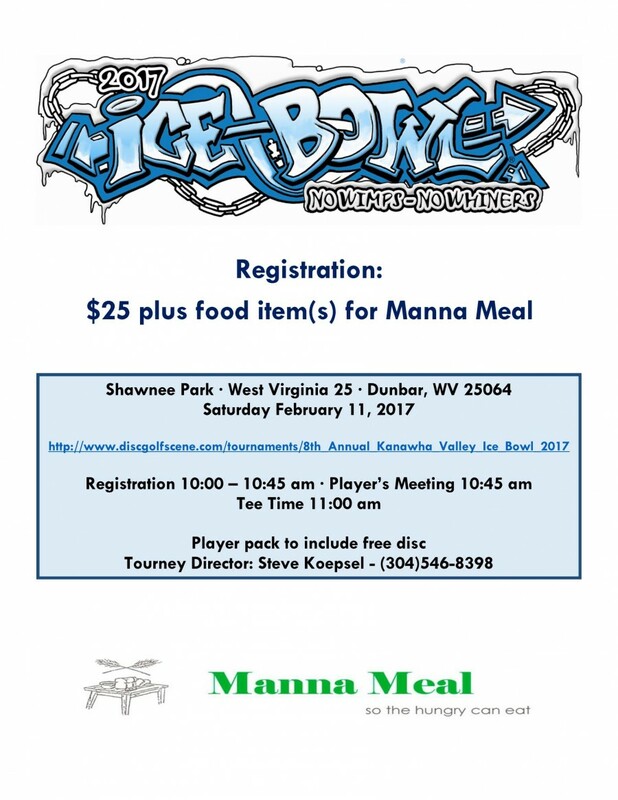 The 8th annual Kanawha Valley Ice Bowl will be held on the golf course at Shawnee Park in Dunbar on Saturday, February 11. The fee for registration will be $25 plus a food donation for Manna Meal. Each registered player will receive a players pack that includes a free Gateway disc and a mini. 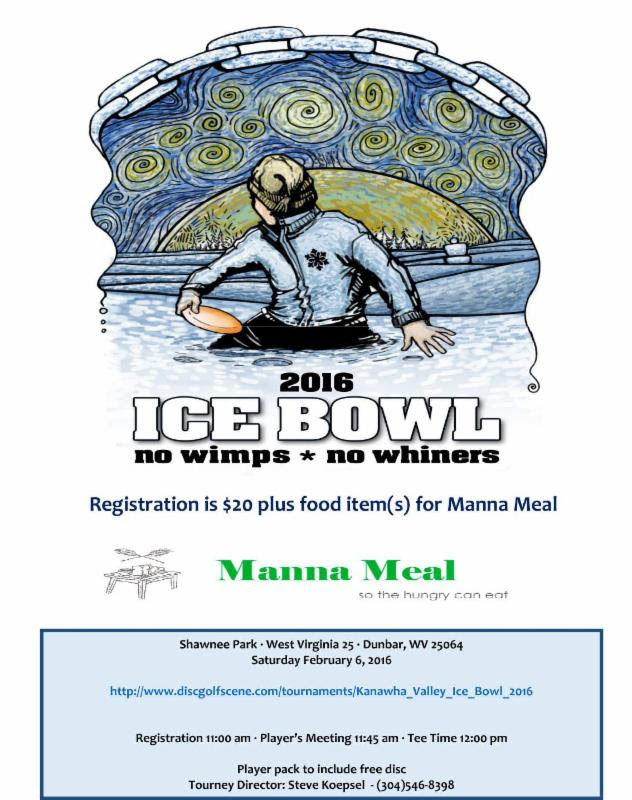 For registration or other information about the 2016 Ice Bowl, visit The Disc Golf Scene. 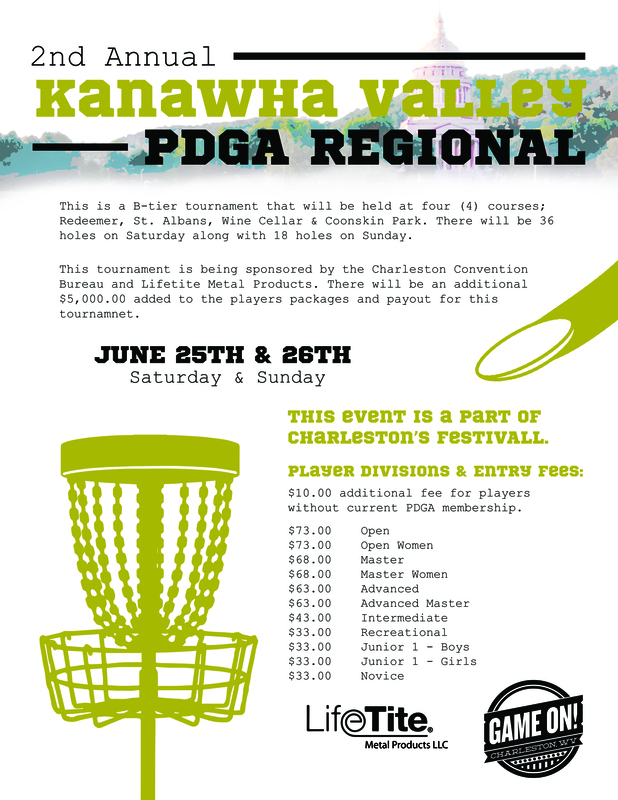 The Second Annual Kanawha Valley PDGA Regional will take place Saturday, June 25, and Sunday, June 26, 2016. 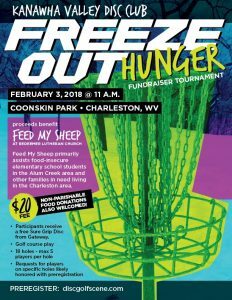 This is a B-tier tournament that will be held at Coonskin Park, Redeemer Park, Wine Cellar Park, and St. Albans City Park. 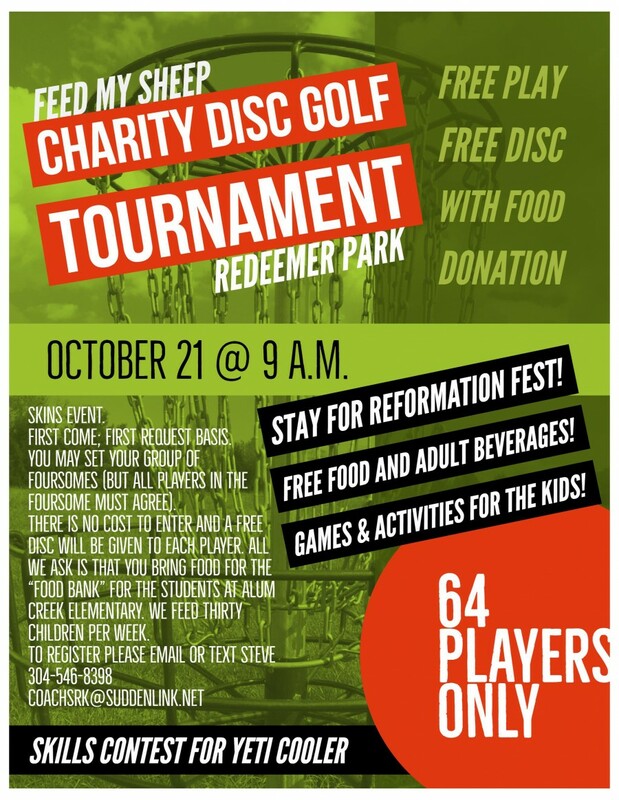 Redeemer will host a spaghetti dinner on Friday night. Players will play 36 holes on Saturday and 18 holes on Sunday. 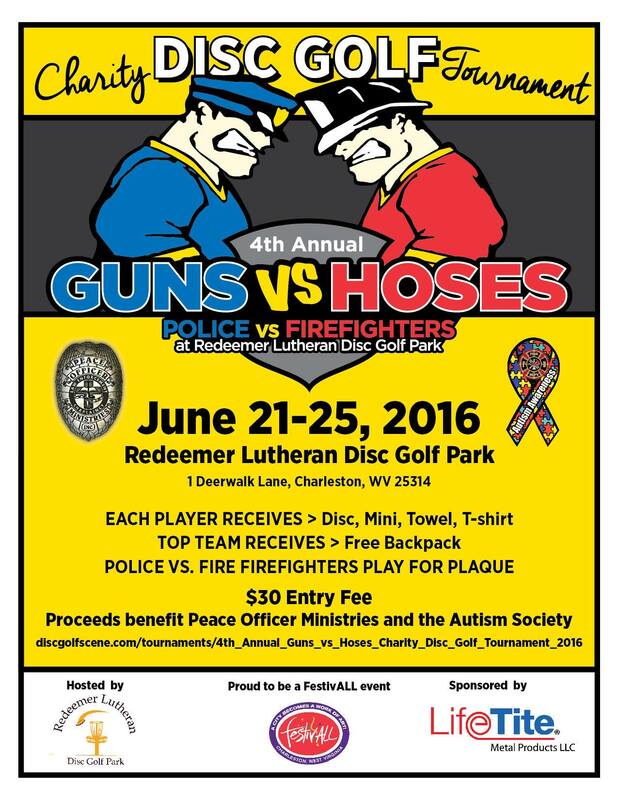 The Fourth Annual Guns vs. Hoses Tournament will take place June 21-25, 2016, at Redeemer Park and Wine Cellar Park. 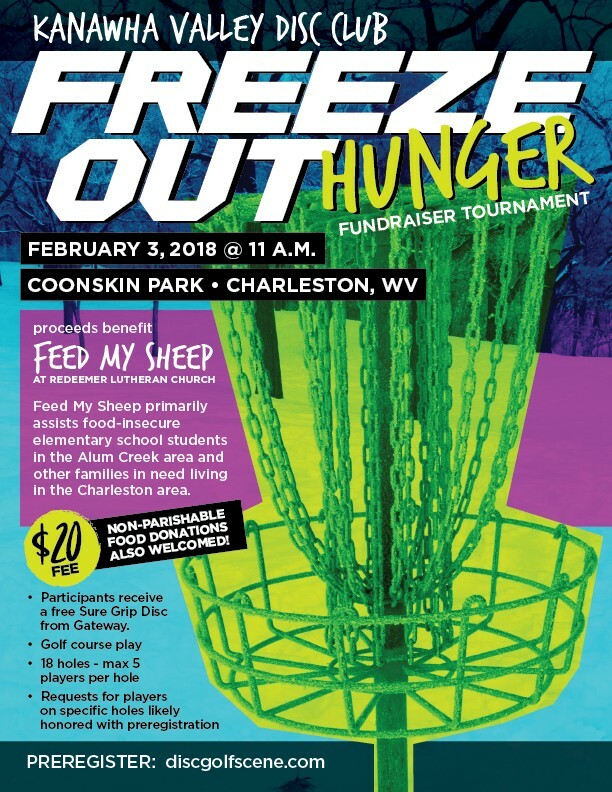 This is a charity tournament. 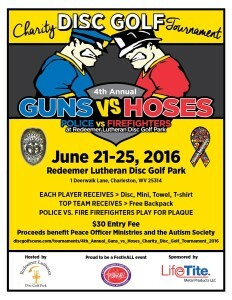 Proceeds from entry fees will benefit Peace Officer Ministries and the Autism Society. Players will compete in teams of four plus one optional alternate. A putting and mid-range competition will take place on Tuesday, June 21, at Redeemer. A driving competition will take place on Thursday, June 23, at Wine Cellar. Teams will compete in a team play tournament during the weekend starting Saturday, June 25. 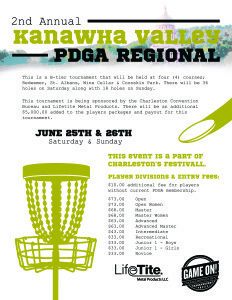 Note that this tournament coincides with the Second Annual Kanawha Valley PDGA Regional, a B-tier tournament. 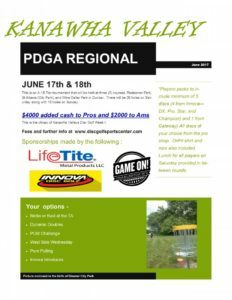 Players who are registered for the PDGA Regional can participate in the Guns vs. Hoses charity tournament free-of-charge. If you are traveling to the Charleston area from out-of-town for the tournament, then you will have the option of completing the skills competition portion of the event on Saturday. 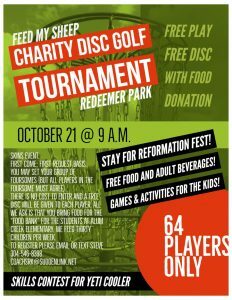 For more information and online registration, visit the tournament’s page at The Disc Golf Scene. 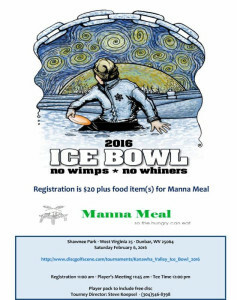 The 2016 Ice Bowl will take place on the golf course at Shawnee Park in Dunbar on Saturday, February 6. 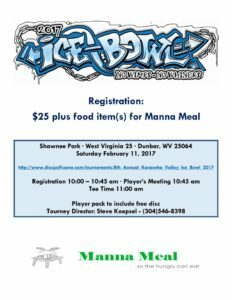 The fee for registration is $20 plus a food donation for Manna Meal. 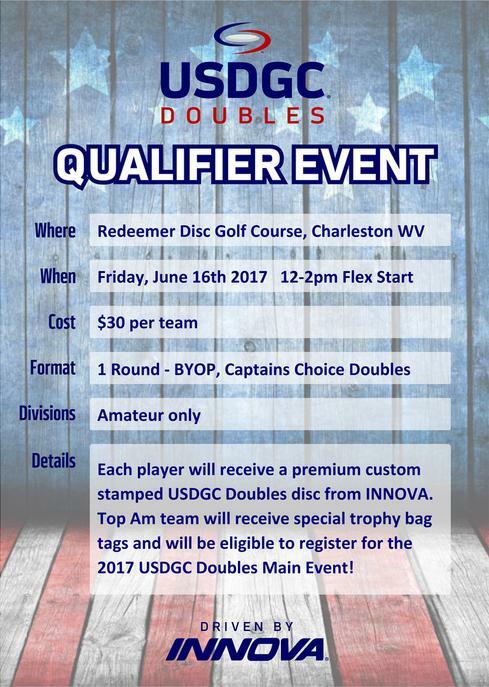 Each registered player will receive a players pack that includes a free disc.